You can interact with this calendar to find events that interest you, add events to your personal calendar, stay informed about upcoming events, and more. Click one of the following blue links to see brief instructions. To hide the instructions, click the link a second time. Tip Some features you read about may not be available in the specific calendar you're visiting. Calendar layout determines how much information is presented for each event and how event information is arranged. You control the layout by using the View Chooser to change the calendar view. Using the previous and next buttons and the Date Finder, you can navigate to future or past dates and time periods. The View Chooser might consist of a set of tabs or a drop-down list. To see the previous or next time period, click the paging arrows at the top left of the calendar. Some calendars use standard paging buttons. Other calendars use the Prev/Next default images (as shown below) or custom images (not shown). 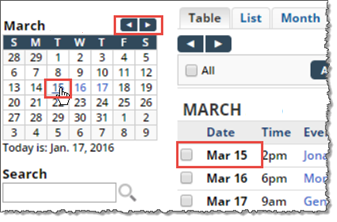 With the Date Finder, you can show the events for a specific date. Use the arrows at the top of the Date Finder to move between months. Click a date to show its events in the calendar. On some Date Finders, you can hover on a date to show a popup of the events for that date. Click an event title to see details. 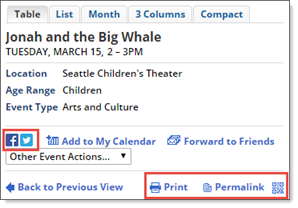 Depending upon the options the calendar publisher provides, you can search for events by keyword, location, and/or date. Type a keyword or words into the search box, and then click the button. Tip Truncate words with * to search for a variety of endings (such as Mexico and Mexican). Type a street address, a landmark name, or a neighborhood name, and then click the Search button. Be specific or you may be asked to select your location from a list of possibilities. If you share location on your mobile device, location search might automatically know where you are. To search by date, use one of these formats: October 2016, 2016 October, Oct 2016, 15 October 2016, 10/15/16, 10/15/2016. Putting the day first (15/10/2016) won't work. Search results are described in a results bar above the calendar. Matching events are listed below the search results bar. To start a new search, click Clear in the results bar. If the previous (or next) button is active, click it to see matching events from the previous (or next) time period. To learn about broadening or narrowing your search, using location search, and more, click the results bar Help link. If no events in the current view match your search, the results bar lets you know. If the search results bar looks like this, navigate to the previous time period or clear the search and try a different keyword. 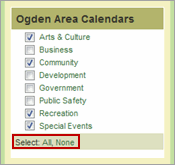 Many organizations opt to provide filters adjacent to the main calendar. By selecting values in filters, you can limit the events shown in the calendar to make it easier to find events you care about. For example, you might use an audience filter to see only events aimed at adults and seniors. You might use an event type filter to see only sports and outdoor-oriented events. Or, you might use a calendar/category filter to see only Arts & Culture events. Filters come in different types. In this type of filter, you can select multiple values. In this type of filter, you can select one value at a time. Occasionally, you might encounter dependent filters. When filters are dependent, a second filter appears only after you select a value in the first filter. 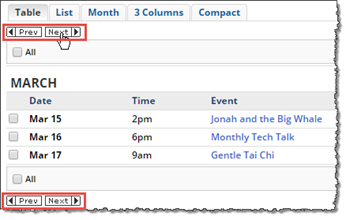 When you filter by fields, such as audience, event type, or neighborhood, a results bar appears above the calendar. Events that match the selected filter values appear below the results bar. To clear the results of your filter choices, click Clear in the results bar. If the previous and next buttons are active, click them to see matching events from other time periods. To see tips for using filters, click the results bar Help link. You can combine searches for keyword, location, or date with selecting filter values. If the results bar looks like this, navigate to the previous time period. Or, clear the search and filter values and start over. When you filter by calendar/category, you don't see a results bar above the calendar. To stop filtering and see events from all calendars, click All at the bottom of the values list. To change what you filter by, select a different set of values. Add events to your personal calendar. Forward event information to friends. Set up an email or text message reminder. Request notification of event changes by email. Send yourself event information by email or text message. Download event information as an iCalendar (.ics) file. Post an event to Twitter, Facebook, and LinkedIn. Comment on an event using Disqus or Facebook. Copy a direct link (permalink) to the event details page. Download a QR code image file for use online or in print materials. Print the event details page. Tip Calendar publishers decide which event actions to turn on so you may not be able to take all event actions on the calendar you're visiting. How do I take an action? You can initiate some event actions directly from the calendar. To take other actions, you first have to open an event details page. If you see check boxes beside events, select the event(s) you want to take actions on. After selecting events, click Add to My Calendar or select an action from the More Event Actions list. If you see calendar icons beside events, click the icon for the event you want to take actions on. Clicking the icon opens the Event Actions window where you can take actions on selected events. To set a text message reminder, for example, you provide your mobile phone number, carrier, and the time in advance of the event you want the reminder to arrive. If you don't see check boxes or icons, click the event title to open the event details page. Clicking the description opens the event details page. Scroll to the bottom of the page to find the event actions you can take. Several event actions are available only from the event details page. To post an event to social media, copy a details page link, download a QR image file, print the details page, or comment on an event, you must open event details. How do I get help with an action? If you're setting up an action in the Event Actions window, you can click Help in the window's upper-right corner. The Help link brings up the My Events FAQ page. Subscribing to a calendar email adds you to a calendar's distribution list. You'll receive a regularly scheduled email message that contains a list of upcoming, new, and updated events. 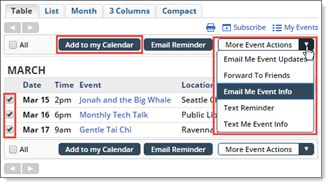 After signing into Event Actions, select Weekly Email to set up the recurring notifications. Want to learn more about subscribing to calendar email? See Subscribe to a calendar. By subscribing to a calendar's feed, you'll receive feed updates every time new events are added or existing events are changed. 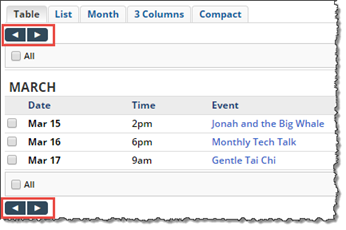 After signing into Event Actions, select RSS Feed or ATOM (XML) Feed to set up a calendar feed. Want to learn more about RSS and Atom feeds? See Subscribe to a calendar. Subscribing to an iCalendar feed adds a new calendar to your calendar program that contains the events from the original calendar to which you subscribed. As the original calendar's owner adds and updates events, those changes automatically appear in your local version. Another option is downloading an iCalendar file. Downloading places a file with an .ics extension (for example, downloadedfile.ics) on your computer. You can open the file with or import the file into your calendar program. No connection is established between the original calendar and the downloaded file. If the original calendar's owner adds or updates events, those changes are not passed to the downloaded file. After signing into Event Actions, select iCalendar Subscribe to subscribe to an iCalendar feed. Or, select iCalendar download to download an iCalendar file. What happens after you subscribe or download depends upon the calendar program you use and your computer's operating system. To learn more, see Subscribe to a calendar. 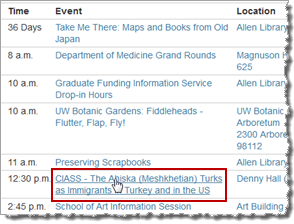 If you see a Submit Events link near the calendar, you can submit your own events for publication. Organizations typically review submitted events before they go live. Tip If the organization provides event submission guidelines, be sure to read the guidelines before you submit. Clicking the link opens an event submission form. Tip The link may look different from what's shown here. In the form, type your personal information. Note that asterisks (*) indicate required fields. Provide the requested details about the event. You receive a confirmation email message that summarizes the event you submitted. We recommend that you save the message, as it includes a Withdraw event submission link in case the event is canceled. To get help while you're submitting, scroll to the bottom of the form you're filling out, and then click Help.